Conquest of Mexico by Cortés, oil on canvas. 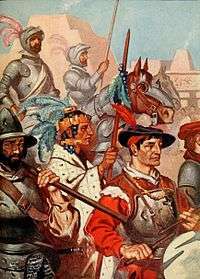 The Spanish conquest of the Aztec Empire (begun February 1519) was one of the most significant events in the Spanish colonization of the Americas. Following Christopher Columbus' establishment of permanent European settlement in the Caribbean, the Spanish authorized expeditions or entradas for the discovery, conquest, and colonization of new territory, using existing Spanish settlements as a base. Many of those on the Cortés expedition of 1519 had never seen combat before. In fact, Cortés had never commanded men in battle before. However, there was a whole generation of Spaniards who participated in expeditions in the Caribbean and Tierra Firme (Central America), learning strategy and tactics of successful enterprises. The Spanish conquest of Mexico had antecedents with established practices. 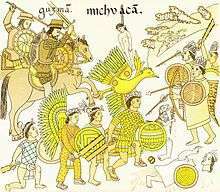 The Spanish campaign began in February 1519, and was declared victorious on August 13, 1521, when a coalition army of Spanish forces and native Tlaxcalan warriors led by Hernán Cortés and Xicotencatl the Younger captured the emperor Cuauhtemoc and Tenochtitlan, the capital of the Aztec Empire. 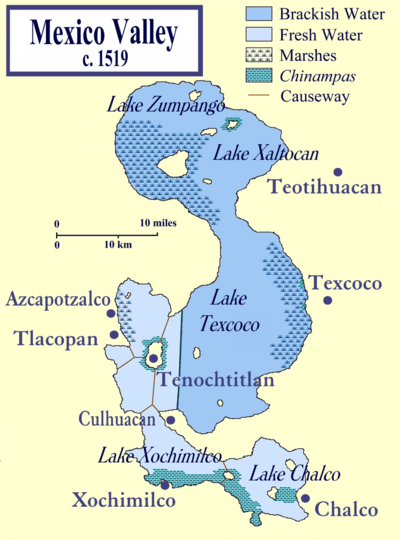 During the campaign, Cortés was given support from a number of tributaries and rivals of the Aztecs, including the Totonacs, and the Tlaxcaltecas, Texcocans, and other city-states particularly bordering Lake Texcoco. In their advance, the allies were tricked and ambushed several times by the people they encountered. After eight months of battles and negotiations, which overcame the diplomatic resistance of the Aztec Emperor Moctezuma II to his visit, Cortés arrived in Tenochtitlan on November 8, 1519, where he took up residence, welcomed by Moctezuma. When news reached Cortés of the death of several of his men during the Aztec attack on the Totonacs in Veracruz, he took the opportunity to take Moctezuma captive, Moctezuma allowed himself to be captured as a diplomatic gesture. Capturing the cacique or indigenous ruler was standard operating procedure for Spaniards in their expansion in the Caribbean, so capturing Moctezuma had considerable precedent, which might well have included those in Spain during the Christian reconquest of territory held by Muslims. When Cortés left Tenochtitlan to return to the coast and deal with the expedition of Pánfilo de Narváez, Pedro de Alvarado was left in charge. Alvarado allowed a significant Aztec feast to be celebrated in Tenochtitlan and on the pattern of the earlier massacre in Cholula, closed off the square and massacred the celebrating Aztec noblemen. The biography of Cortés by Francisco López de Gómara contains a description of the massacre. 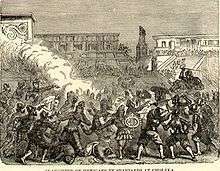 The Alvarado massacre at the Main Temple of Tenochtitlan precipitated rebellion by the population of the city. When the captured emperor Moctezuma II, now seen as a mere puppet of the invading Spaniards, attempted to calm the outraged populace, he was killed by a projectile. Cortés had returned to Tenochtitlan and his men fled the capital city during the Noche Triste in June, 1520. 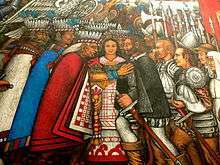 The Spanish, Tlaxcalans and reinforcements returned a year later on August 13, 1521 to a civilization that had been wiped out by famine and smallpox. This made it easier to conquer the remaining Aztecs. The fall of the Aztec Empire was the key event in the formation of the Spanish overseas empire, with New Spain, which later became Mexico, a major component. 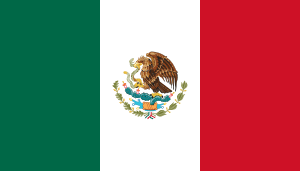 The conquest of Mexico is not only a significant event in world history as the first successful conquest of a great pre-Columbian civilization, but is also particularly important because there are multiple accounts of the conquest from different points of view, Spanish and indigenous of diverse backgrounds. 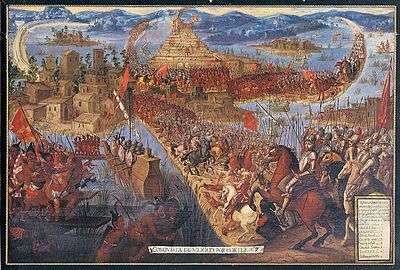 The Spanish conquerors could and did write accounts that narrated the conquest from the first landfalls in Mexico to the final victory over the Mexica in Tenochtitlan on August 13, 1521. Indigenous accounts are from particular native viewpoints (either allies or opponents) and as the events had a direct impact on their polity. All accounts of the conquest, Spanish and indigenous alike, have biases and exaggerations. In general, Spanish accounts do not credit their indigenous allies' support. Individual conquerors' accounts exaggerate that individual's contribution to the conquest, downplaying other conquerors'. Indigenous allies' accounts stress their loyalty to the Spanish and their particular aid as being key to the Spanish victory. Their accounts are similar to Spanish conquerors' accounts contained in petitions for rewards, known as benemérito petitions. The first Spanish account of the conquest was written by lead conqueror Hernán Cortés, who sent a series of letters to the Spanish monarch Charles V, giving a contemporary account of the conquest from his point of view, in which he justified his actions. These were almost immediately published in Spain and later in other parts of Europe. Much later, Spanish conqueror Bernal Díaz del Castillo, a well-seasoned participant in the conquest of Central Mexico, wrote what he called The True History of the Conquest of New Spain, countering the account by Cortés's official biographer, Francisco López de Gómara. Bernal Díaz's account had begun as a benemérito petition for rewards but he expanded it to encompass a full history of his earlier expeditions in the Caribbean and Tierra Firme and the conquest of the Aztec. A number of lower rank Spanish conquerors wrote benemérito petitions to the Spanish Crown, requesting rewards for their services in the conquest, including Juan Díaz, Andrés de Tapia, García del Pilar, and Fray Francisco de Aguilar. Interestingly, Cortés's right-hand man, Pedro de Alvarado did not write at any length about his actions in the New World, and died as a man of action in the Mixtón War in 1542. Two letters to Cortés about Alvarado's campaigns in Guatemala are published in The Conquistadors. The chronicle of the so-called "Anonymous Conqueror" was written sometime in the sixteenth century, entitled in an early twentieth-century translation to English as Narrative of Some Things of New Spain and of the Great City of Temestitan (i.e. Tenochtitlan). Rather than it being a petition for rewards for services, as many Spanish accounts were, the Anonymous Conqueror made observations about the indigenous situation at the time of the conquest. The account was used by eighteenth-century Jesuit Francisco Javier Clavijero in his descriptions of the history of Mexico. On the indigenous side, the allies of Cortés, particularly the Tlaxcalans, wrote extensively about their services to the Spanish Crown in the conquest, arguing for special privileges for themselves. The most important of these are the pictorial Lienzo de Tlaxcala and the Historia de Tlaxcala by Diego Muñoz Camargo. Less successfully, the Nahua allies from Huexotzinco (or Huejotzinco) near Tlaxcala argued that their contributions had been overlooked by the Spanish. In a letter in Nahuatl to the Spanish Crown, the indigenous lords of Huejotzinco lay out their case in for their valorous service. The letter has been published in Nahuatl and English translation by James Lockhart in We People Here: Nahuatl Accounts of the Conquest of Mexico in 1991. Texcoco patriot and member of a noble family there, Fernando Alva Ixtlilxochitl, likewise petitioned the Spanish Crown, in Spanish, saying that Texcoco had not received sufficient rewards for their support of the conquistadors, particularly after the Spanish were forced out of Tenochtitlan. The best-known indigenous account of the conquest is Book 12 of Bernardino de Sahagún's General History of the Things of New Spain and published as the Florentine Codex, in parallel columns of Nahuatl and Spanish, with pictorials. Less well-known is Sahagún's 1585 revision of the conquest account, which shifts from the indigenous viewpoint entirely and inserts at crucial junctures passages lauding the Spanish and in particular Hernán Cortés. Another indigenous account compiled by a Spanish friar is Dominican Diego Durán's The History of the Indies of New Spain, from 1581, with many color illustrations. A text from the Nahua point of view, the Anales de Tlatelolco, an early indigenous account in Nahuatl, perhaps from 1540, remained in indigenous hands until it was published. An extract of this important manuscript was published in 1991 by James Lockhart in Nahuatl transcription and English translation. A popular anthology in English for classroom use is Miguel León-Portilla's, The Broken Spears: The Aztec Accounts of the Conquest of Mexico from 1992. Not surprisingly, many publications and republications of sixteenth-century accounts of the conquest of Mexico appeared around 1992, the 500th anniversary of Christopher Columbus's first voyage, when scholarly and popular interest in first encounters surged. The most popular and enduring narrative of the Spanish campaign in central Mexico is by New England-born nineteenth-century historian William Hickling Prescott. His History of the Conquest of Mexico, first published in 1843, remains an engaging narrative of the conquest, based on a large number of sources copied from the Spanish archives. Prescott based his narrative history on primary source documentation, mainly from the Spanish viewpoint, but it is likely that the copy of the Spanish text of the 1585 revision of Bernardino de Sahagǘn's account of the conquest was done for Prescott's history. In the sources recorded by Franciscan Bernardino de Sahagún and Dominican Diego Durán, there are accounts of events that were interpreted as supernatural omens of the conquest. These two accounts are full-blown narratives from the viewpoint of the Spanish opponents. Most first-hand accounts about the conquest of the Aztec Empire were written by Spaniards: Hernán Cortés' letters to Charles V, Holy Roman Emperor and the first-person narrative of Bernal Díaz del Castillo, The True History of the Conquest of New Spain. The primary sources from the native people affected as a result of the conquest are seldom used, because they tend to reflect the views of a particular native group, such as the Tlaxcalans. Indigenous accounts were written in pictographs as early as 1525. 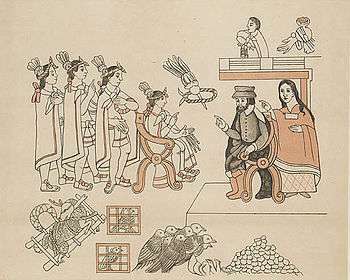 Later accounts were written in the native tongue of the Aztec and other native peoples of central Mexico, Nahuatl. Omens were extremely important to the Aztecs, who believed that history repeated itself. Emperor Moctezuma, often spelled Montezuma in English, who was trained as a high priest, was said to have consulted his chief priests and fortune tellers to determine the causes of these omens. However, they were unable to provide an exact explanation until, perhaps, the Spanish arrived. A number of modern scholars cast doubt on whether such omens occurred or whether they were ex post facto (retrospective) creations to help the Mexica explain their defeat. Many sources depicting omens and the return of old Aztec gods, including those supervised by Spanish priests, were written after the fall of Tenochtitlan in 1521. Some ethnohistorians say that when the Spanish arrived native peoples and their leaders did not view them as supernatural in any sense but rather as simply another group of powerful outsiders. Many Spanish accounts incorporated omens to emphasize what they saw as the preordained nature of the conquest and their success as Spanish destiny. This means that native emphasis on omens and bewilderment in the face of invasion "may be a postconquest interpretation by informants who wished to please the Spaniards or who resented the failure of Montezuma and of the warriors of Tenochtitlan to provide leadership." Hugh Thomas concludes that Moctezuma was confused and ambivalent about whether Cortés was a god or the ambassador of a great king in another land. However, Thomas does not support the theory that the Aztec Emperor really believed that Cortés was any reincarnation of Quetzalcoatl. At that time, Yucatán was briefly explored by the conquistadors, but the Spanish conquest of Yucatán with its many independent city-state polities of the Late Postclassic Maya civilization came many years after the Spaniards' rapid conquest of Central Mexico, from 1519 to 1521. With the help of tens of thousands of Xiu Mayan warriors, it would take more than 170 years for the Spanish to establish full control of the Maya homelands, which extended from northern Yucatán to the central lowlands region of El Petén and the southern Guatemalan highlands. The end of this latter campaign is generally marked by the downfall of the Maya state based at Tayasal in the Petén region, in 1697. Even before Juan de Grijalva returned to Spain, Velázquez decided to send a third and even larger expedition to explore the Mexican coast. Hernán Cortés, then one of Velázquez's favorites and brother-in-law, was named as the commander, which created envy and resentment among the Spanish contingent in the Spanish colony. Velázquez's instructions to Cortés, in an agreement signed on 23 October 1518, were limited to leading an expedition to initiate trade relations with the indigenous coastal tribes, but no authorization for conquest or settlement. One account suggests that Governor Velázquez wished to restrict the Cortés expedition to being a pure trading expedition. Invasion of the mainland was to be a privilege reserved for himself as the senior official in Cuba. However, by calling upon the knowledge of the law of Castile that Cortés likely gained while he was a student in Salamanca and by utilizing his powers of persuasion, Cortés was able to maneuver Governor Velázquez into inserting a clause into his orders that enabled Cortés to take emergency measures without prior authorization, if such were "...in the true interests of the realm." He was also named the chief military leader and chief magistrate (judge) of the expedition. Such licenses for expeditions allowed the Crown to retain sovereignty over newly conquered lands while not risking its own assets in the enterprise. Spaniards with assets who were willing to risk them to increase their wealth and power could potentially gain even more. Cortés invested a considerable part of his personal fortune to equip the expedition and probably went into debt to borrow additional funds. Expeditions of exploration and conquest were business enterprises, with those investing more in the enterprise receiving higher rewards upon its success; greater risk reaped greater rewards. Men who brought horses, caballeros, received two shares of the spoils of war, one for the warrior himself, another because of the horse. When Cortés' assets were depleted, Governor Velázquez may have personally contributed nearly half the cost of the expedition. The ostentatious nature of this operation and the swiftness of its commission probably added to the envy and resentment of the Spanish contingent in Cuba, who were keenly aware of the opportunity this assignment offered for fame, fortune and glory. Therefore, Velázquez sent Luis de Medina with orders to replace Cortés. However, Cortés' brother-in-law allegedly had Medina intercepted and killed. 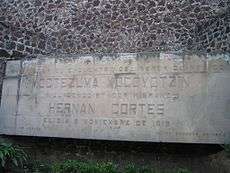 The papers that Medina had been carrying were sent to Cortés. Thus warned, Cortés accelerated the organization and preparation of his expedition. Cortés's contingent consisted of 11 ships carrying about 630 men (including 30 crossbowmen and 12 arquebusiers, an early form of firearm), a doctor, several carpenters, at least eight women, a few hundred Cuban Arawaks and some Africans, both freedmen and slaves. Although modern usage often calls the European participants "soldiers", the term was never used by these men themselves in any context, something that James Lockhart realized when analyzing sixteenth-century legal records from conquest-era Peru. Cortés spent some time at the island of Cozumel, on the east coast of Yucatán, trying to convert the locals to Christianity, something that provided mixed results. While at Cozumel, Cortés heard reports of other white men living in the Yucatán. Cortés sent messengers to these reported castilianos, who turned out to be the survivors of a Spanish shipwreck that had occurred in 1511, Gerónimo de Aguilar and Gonzalo Guerrero. Aguilar petitioned his Maya chieftain to be allowed to join his former countrymen, and he was released and made his way to Cortés's ships. According to Bernal Díaz, Aguilar relayed that before coming, he had attempted to convince Guerrero to leave as well. Guerrero declined on the basis that he was by now well-assimilated with the Maya culture, had a Maya wife and three children, and he was looked upon as a figure of rank within the Maya settlement of Chetumal, where he lived. Although Guerrero's later fate is somewhat uncertain, it appears that for some years he continued to fight alongside the Maya forces against Spanish incursions, providing military counsel and encouraging resistance; it is speculated that he may have been killed in a later battle. Aguilar, now quite fluent in Maya, as well as some other indigenous languages, proved to be a valuable asset for Cortés as a translator - a skill of particular significance to the later conquest of the Aztec Empire that was to be the end result of Cortés' expedition. After leaving Cozumel, Hernán Cortés continued round the tip of the Yucatán Peninsula and landed at Potonchán, where there was little gold. However, Cortés, after defeating the local natives in two battles, discovered a far more valuable asset in the form of a woman whom Cortés would have christened Marina. She is often known as La Malinche and also sometimes called "Malintzin" or Malinalli, her native birth names. Later, the Aztecs would come to call Cortés "Malintzin" or La Malinche by dint of his close association with her. Her lineage notwithstanding, Cortés had stumbled upon one of the keys to realizing his ambitions. He would speak to Gerónimo de Aguilar in Spanish who would then translate into Mayan for Marina. She would then translate from Mayan to Nahuatl. With this pair of translators, Cortés could now communicate to the Aztecs. :86–87 How effectively is still a matter of speculation, since Marina did not speak the dialect of the Aztecs, nor was she familiar with the protocols of the Aztec nobility, who were renowned for their flowery, flattering talk. Doña Marina quickly learned Spanish, and became Cortés's primary interpreter, confidant, consort, cultural translator, and the mother of his son, Martin. :82 Until Cortes's marriage to his second wife, a union which produced a legitimate son whom he also named Martin, Cortés's natural son with Marina was the heir of his envisaged fortunes. Native speakers of Nahuatl would call her "Malintzin." This name is the closest phonetic approximation possible in Nahuatl to the sound of 'Marina' in Spanish. Over time, "La Malinche" (the modern Spanish cognate of 'Malintzin') became a term that describes a traitor to one's people. To this day, the word malinchista is used by Mexicans to denote one who apes the language and customs of another country. It would not be until the late 20th century that a few feminist writers and academics would attempt to rehabilitate La Malinche as a woman who made the best of her situation and became, in most respects, the most powerful woman in the Western Hemisphere, as well as the founder of the modern Mexican nation. There is a popular misconception that the ships were burned rather than sunk. This misconception has been attributed to the reference made by Cervantes de Salazár in 1546, as to Cortés burning his ships. This may have also come from a mistranslation of the version of the story written in Latin. With all of his ships scuttled, Cortés effectively stranded the expedition in central Mexico. However, it did not completely end the aspirations of those members of his company who remained loyal to the Governor of Cuba. Cortés then led his band inland towards the fabled Tenochtitlan. Cholula was one of the most important cities of Mesoamerica, the second largest, and probably the most sacred. Its huge pyramid (larger in volume than the great pyramids of Egypt) made it one of the most prestigious places of the Aztec religion. However, it appears that Cortés perceived Cholula more as a military threat to his rear guard as he marched to Tenochtitlan than a religious center. He sent emissaries ahead to try a diplomatic solution to enter the city. They captured the Cholulan leaders Tlaquiach and Tlalchiac and then ordered the city to be set on fire. The troops started in the palace of Xacayatzin, and then on to Chialinco and Yetzcoloc. 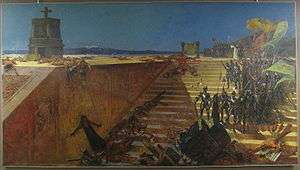 In letters to his King, Cortés claimed that in three hours time his troops (helped by the Tlaxcalans) killed 3,000 people and had burned the city. Another witness, Vázquez de Tapia, claimed the death toll was as high as 30,000. Of course, the reports by the Spaniards were usually gross exaggerations. Since the women and children, and many men, had already fled the city,:200–201 it is unlikely that so many were killed. Regardless, the massacre of the nobility of Cholula was a notorious chapter in the conquest of Mexico. This contradiction between "the arrogant emperor' and the "humble servant of Quetzalcoatl" has been problematic for historians to explain and has led to much speculation. However, all the proscriptions and prohibitions regarding Moctezuma and his court had been established by Moctezuma and were not part of traditional Aztec customs. Those prohibitions had already caused friction between Moctezuma and the pillis (noble classes). There is even an Aztec legend in which Huemac, the legendary last lord of Tollan Xicotitlan, instructed Moctezuma to live humbly and eat only the food of the poor, to divert a future catastrophe. Thus, it seems out of character for Moctezuma to violate rules that he himself had promulgated. Yet, as supreme ruler, he had the power to break his own rules. Tenochtitlan had been almost totally destroyed by fire and cannon fire during the siege, and once it finally fell, the Spanish continued its destruction, as they soon began to establish the foundations of what would become Mexico City on the site. The surviving Aztec people were forbidden to live in Tenochtitlan and the surrounding isles, and were banished to live in Tlatelolco. The Council of the Indies was constituted in 1524 and the first Audiencia in 1527. In 1535, Charles V the Holy Roman Emperor (who was as the King of Spain known as Charles I), named the Spanish nobleman Don Antonio de Mendoza the first Viceroy of New Spain. Mendoza was entirely loyal to the Spanish crown, unlike the conqueror of Mexico Hernán Cortés, who had demonstrated that he was independent-minded and defied official orders when he threw off the authority of Governor Diego Velázquez de Cuéllar in Cuba. The name "New Spain" had been suggested by Cortés and was later confirmed officially by Mendoza. The fall of Tenochtitlan usually is referred to as the main episode in the process of the conquest of Mesoamerica. However, this process was much more complex and took longer than the three years that it took Cortés to conquer Tenochtitlan. It took almost 60 years of wars for the Spaniards to suppress the resistance of the Indian population of Mesoamerica. The Spanish conquest of Yucatán took almost 170 years. The whole process could have taken longer were it not for three separate epidemics that took a heavy toll on the Native Americans, causing the population to fall in half and weakening the traditional social structure. 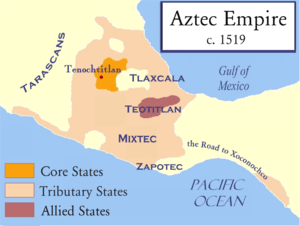 The Aztec Empire ceased to exist with the Spanish final conquest of Tenochtitlan in August 1521. 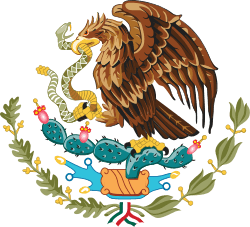 The empire had been composed of separate city-states that had either allied with or been conquered by the Mexica of Tenochtitlan, and rendered tribute to the Mexica while maintaining their internal ruling structures. Those polities now came under Spanish rule, also retaining their internal structures of ruling elites, tribute paying commoners, and land holding and other economic structures largely intact. Two key works by historian Charles Gibson, Tlaxcala in the Sixteenth Century (1952) and his monograph The Aztecs Under Spanish Rule: A History of the Indians of the Valley of Mexico, 1519-1810 (1964) were central in reshaping the historiography of the indigenous and their communities from the Spanish Conquest to the 1810 Mexican independence era. 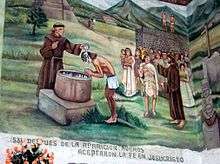 The first mendicants in central Mexico, particularly the Franciscans and Dominicans learned the indigenous language of Nahuatl, in order to evangelize to the indigenous people in their native tongue. Early mendicants created texts in order to forward the project of Christianization. Particularly important were the 1571 Spanish-Nahuatl dictionary compiled by the Franciscan Fray Alonso de Molina, and his 1569 bilingual Nahuatl-Spanish confessional manual for priests. A major project by the Franciscans in Mexico was the compilation of knowledge on Nahua religious beliefs and culture that friar Bernardino de Sahagún, oversaw, using indigenous informants, resulting in a number of important texts and culminating in a 12 volume text, The General History of the Things of New Spain published in English as the Florentine Codex. The Spanish crown via the Council of the Indies and the Franciscan order in the late sixteenth century became increasingly hostile to works by religious in the indigenous languages, concerned that they were heretical and an impediment to the Indians' true conversion. The other discovery that perpetuated this system of indigenous forced labor were the extensive silver mines discovered at Potosi, in Upper Peru (now Bolivia) and other places in the Spanish empire in the New World that were worked for hundreds of years by forced native labor and contributed most of the wealth that flowed to Spain. According to West, "slavery was a well established institution among the Aztecs and their neighbors." "During the Conquest, Spaniards legally enslaved large numbers of natives - men, women and children - as booty of warfare, branding each individual on the cheek." In fact, "Cortes owned several hundred, used mainly in gold placering." Indian slavery was abolished in 1542, but persisted until the 1550s. The Aztec education system was abolished and replaced by a very limited church education. Even some foods associated with Mesoamerican religious practice, such as amaranth, were forbidden. In the 16th century, perhaps 240,000 Spaniards entered American ports. They were joined by 450,000 in the next century. Unlike the English-speaking colonists of North America, the majority of the Spanish colonists were single men who married or made concubines of the natives, and were even encouraged to do so by Queen Isabella during the earliest days of colonization. As a result of these unions, as well as concubinage and secret mistresses, mixed race individuals known as "Mestizos" came into being as the majority of the Mexican population in the centuries following the Spanish conquest. The aftermath of the Spanish conquest, including the Aztecs' struggle to preserve their cultural identity, is the subject of the acclaimed Mexican feature film, The Other Conquest, directed by Salvador Carrasco. ↑ James Lockhart and Stuart Schwartz, Early Latin America: A History of Colonial Spanish America and Brazil. New York: Cambridge University Press, 1983. See especially chapter 3, "From islands to mainland: the Caribbean phase and subsequent conquests." ↑ Francisco López de Gómara, Cortés: The Life of the Conqueror by His Secretary, translated by Lesley Byrd Simpson. Berkeley: University of California Press 1964, pp. 207-08. ↑ Ida Altman, et al. The Early History of Greater Mexico, Pearson, 2003, p. 59. ↑ Patricia de Fuentes, ed. The Conquistadors: First-Person Accounts of the Conquest of Mexico, Norman: University of Oklahoma Press 1993. Previously published by Orion Press 1963. ↑ Fray Bernardino de Sahagún, The Conquest of New Spain, 1585 Revision translated by Howard F. Cline, with an introduction by S.L. Cline. University of Utah Press 1989. ↑ Fray Diego Durán, The History of the Indies of New Spain, Trans., annotated, and with an introduction by Doris Heyden. Norman: University of Oklahoma Press, 1994. ↑ S.L. Cline "Introduction," History of the Conquest of New Spain, 1585 Revision by Bernardino de Sahagún, Salt Lake City: University of Utah Press 1989. ↑ Fray Bernardino de Sahagún, General History of the Things of New Spain (The Florentine Codex). Book 12. Arthur J.O. Anderson and Charles Dibble, translators. Salt Lake City: University of Utah Press. ↑ Schwartz, Stuart B., ed. Victors and Vanquished: Spanish and Nahua Views of the Conquest of Mexico. Boston: Bedforf, 2000. ↑ Hassig, Ross, Mexico and the Spanish Conquest. Longman: London and New York, 1994. p. 46. ↑ James Lockhart, Spanish Peru, 1532-1560., Madison: University of Wisconsin Press 1968. 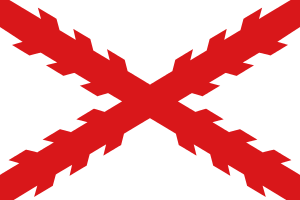 ↑ "Conquistadors - Cortés". PBS. Retrieved 2010-10-31. ↑ Tuck, Jim (2008-10-09). "Affirmative action and Hernán Cortés (1485–1547) : Mexico History". Mexconnect.com. Retrieved 2010-10-31. ↑ See: Restall, Matthew. Seven Myths of the Spanish Conquest. Oxford University Press: Oxford and New York, 2003. ↑ Evans, Susan Toby (2001). Archaeology of ancient Mexico and Central America, an Encyclopedia. New York & London: Garland Publishing, Inc. pp. 139–141. ↑ "Empires Past: Aztecs: Conquest". Library.thinkquest.org. Retrieved 2010-10-31. ↑ Informantes de Sahagún: Códice Florentino, lib. XII, cap. X.; Spanish version by Angel Ma. Garibay K.
1 2 Russell, Philip L. (2010). The history of Mexico from pre-conquest to present. New York: Routledge. p. 12. ISBN 9781136968280. Retrieved 21 October 2016. ↑ "John P. Schmal". Somosprimos.com. Retrieved 2010-10-31. ↑ Nancy Marguerite Farriss (1984). Maya Society Under Colonial Rule: The Collective Enterprise of Survival. Princeton UP. pp. 58–59. ↑ Charles Gibson, The Aztecs Under Spanish Rule: A History of the Indians of the Valley of Mexico, 1519-1810, Stanford: Stanford University Press 1964. ↑ James Lockhart, The Nahuas After the Conquest: Postconquest Central Mexican History and Philology, Stanford: Stanford University Press 1992. ↑ Frances Karttunen, "Aztec Literacy," in George A. Coller et al., eds. The Inca and Aztec States, pp. 395-417. New York: Academic Press 1982. ↑ Fray Alonso de Molina, Confessionario mayor en la lengua castellana y mexicana (1569), With an introduction by Roberto Moreno. Mexico: Instituto de Investigaciones Filológicos, Instituto de Investigaciones Históricos, Universidad Nacional Autónoma de México. ↑ Howard F. Cline, "Evolution of the Historia General" in Handbook of Middle American Indians, Guide to Ethnohistorical Sources, vol. 13, part 2, Howard F. Cline, volume editor, Austin: University of Texas Pres, 1973 p.196. ↑ Axtell, James (September–October 1991). "The Columbian Mosaic in Colonial America". Humanities. 12 (5): 12–18. Archived from the original on 17 May 2008. Retrieved 8 October 2008.
de Fuentes, Patricia, ed. The Conquistadors: First-Person Accounts of the Conquest of Mexico. Norman: University of Oklahoma Press 1993. Previously published by Orion Press 1963. León-Portilla, Miguel (Ed.) (1992) . The Broken Spears: The Aztec Account of the Conquest of Mexico. Ángel María Garibay K. (Nahuatl-Spanish trans. ), Lysander Kemp (Spanish-English trans. ), Alberto Beltran (illus.) (Expanded and updated ed.). Boston: Beacon Press. ISBN 0-8070-5501-8. Lockhart, James. We People Here: Nahuatl Accounts of the Conquest of Mexico, Berkeley and Los Angeles: University of California Press 1991. Sahagún, Fray Bernardino. General History of the Things of New Spain (The Florentine Codex). Book 12. Arthur J.O. Anderson and Charles Dibble, translators. Salt Lake City: University of Utah Press. Schwartz, Stuart B., ed. Victors and Vanquished: Spanish and Nahua Views of the Conquest of Mexico. Boston: Bedford, 2000. Chasteen, John Charles. Born in Blood and Fire: A Concise History of Latin America. New York: W.W. Norton, 2011. Daniel, Douglas A. "Tactical Factors in the Spanish Conquest of the Aztecs." Anthropological Quarterly (1992): 187-194. Francisco Nunez de Pineda y Bascunan. “Happy Captivity.” In Born in Blood and Fire: Latin American Voices, edited by John Charles Chasteen. 42-48. New York: W.W. Norton, 2011. Garofalo, Leo J., and Erin E. O'Connor. 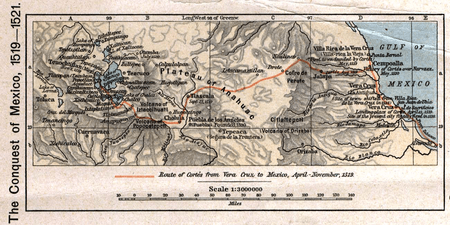 Documenting Latin America : Gender, Race, and Empire, vol. 1. Boston: Prentice Hall, 2011. O'Connor, Erin, and Leo Garofalo. Mothers Making Latin America. Raudzens, George. "So Why Were the Aztecs Conquered, and What Were the Wider Implications? Testing Military Superiority as a Cause of Europe's Pre-Industrial Colonial Conquests." War in History (1995): 87-104. White, John Manchip. "Cortes and the Downfall of the Aztec Empire: A Study in a Conflict of Cultures." The Hispanic American Historical Review (1972): 467-468.